Fugitive, runaway, criminal. These are the words used to describe Clifford Laframboise if you Google his name. Kind, gentle, committed father. These are the words used to describe Clifford Thomas if you ask his friends and family. Laframboise and Thomas are the same man. Born as Clifford Thomas in Hodgson, Man. in 1968, he was adopted by the Laframboise family in South Dakota in 1976. While the public knows Laframboise’s story of escape, they don’t know the circumstances that led him to prison as a young man. 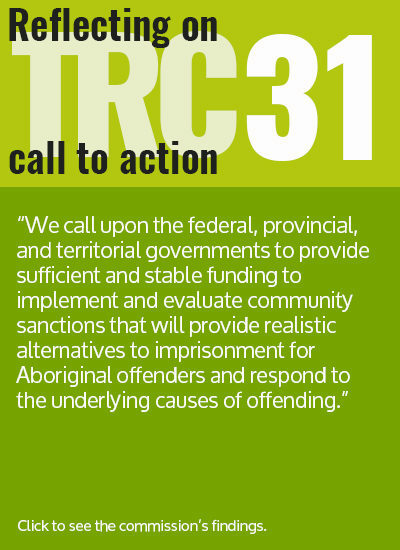 Statistics Canada reports that Aboriginal youth continue to be overrepresented in the criminal justice system. They make up only seven per cent of Canada’s youth population, but account for one-third of all youth under correctional supervision. The road to imprisonment for indigenous youth is often laden by traumatic experiences, some of which the Canadian government was complicit in. Laframboise’s story does not begin with his imprisonment as a young man in South Dakota, but with his interrupted childhood in Manitoba. Laframboise and his four sisters were taken from their family home on the Kinonjeoshtegon First Nation reserve, also known as Jackhead First Nation, in Manitoba on July 6, 1973. Located on the west side of Lake Winnipeg, the reserve had a population of approximately 256 people in 1973. Laframboise was five years old when he was taken from his home and put into foster care. He says he doesn’t remember being taken from the reserve and whether it’s true that no family members were prepared to look after them. Bill Traverse, former Chief of Kinonjeoshtegon First Nation, says Laframboise was one of many indigenous children who were removed from their families and adopted by non-indigenous families as part of the Sixties Scoop. The practice, which began in the 1960’s but continued into the next two decades, often occurred without the consent of the children’s families or bands. The legacy of separating indigenous children from their families and communities continues to impact the lives of these children and parents. For Laframboise, it drastically changed the direction of his life – taking him from foster homes in Winnipeg and ultimately to South Dakota, when he was adopted with his sisters at age eight. The Children’s Aid Society social history report states that Laframboise had six foster homes placements before he and his sisters were adopted. Laframboise remembers these placements, including homes where he endured harsh conditions. Laframboise was eventually placed in a foster home at 153 Antrim Road in Winnipeg. This was Laframboise’s last foster home before getting adopted and he has fond memories of living there. “Those foster parents, they were nice to us. We went to school, I played hockey. It’s what I wanted,” Laframboise said. When Laframboise and his sisters were picked up for adoption, he didn’t understand why he was being forced to leave again. Listen to Clifford share his story. Click the volume button to begin. Lyle and Karen Laframboise, who are both now deceased, began taking foster children from the Standing Rock Sioux Indian Reservation in 1972. One article from the Daily Republic, a South Dakota newspaper, profiled the Laframboise family in 1976. Karen Laframboise describes running her household and disciplining the children she adopted and fostered. Karen Laframboise grew up in Salt Lake City, Utah and her husband, Lyle Laframboise, was a member of the Standing Rock Sioux Tribe. The family followed the Mormon faith, which played a large role in the Laframboise household. “Every day, we’d get up in the morning [at] six, and we’d have to watch some slideshow about the Mormon church,” Laframboise said. “They were really strict with me and my sisters.” When Laframboise started to struggle in school, he received punishments at home. Laframboise says he was told to leave the house by his adoptive mother on multiple occasions, forcing him to walk the streets. “We lived out of town. I’d walk to the main road. She’d call the cops [and say] ‘Oh he ran away again,’” Laframboise said. “So the cops would pick me up and I would sit in jail. It was a repeat thing.” Laframboise says he remembers sitting in jail at age 12 and ending up back there regularly after that. As a teenager, Laframboise turned to theft in order to pay for places to stay. He was 19 years old when he was arrested for multiple burglaries. After pleading guilty to two robberies – one where he broke into a home to steal jewelry and another where he stole about $20 from a church office – he was sentenced to 18 years in prison. Laframboise served six years before he escaped South Dakota State Penitentiary during a work release program on December 26, 1994. After hitchhiking and jumping trains, Laframboise made his way across the border to Emerson, Man. With the help of the Rossbrook House in Winnipeg and Bill Traverse, who was Chief of Kinonjeoshtegon First Nation at the time, Laframboise returned to Jackhead. Laframboise knew his parents were no longer living, but he reunited with extended family upon his return. After living away from his family and the reserve for over 20 years, the reintroduction wasn’t easy. “My auntie, she didn’t really want to meet me [at first],” Laframboise said. “She felt guilty I guess for being gone for all those years and not being there after my mom passed away.” Laframboise also found there was now a language barrier he didn’t anticipate. The residents of Jackhead didn’t know Laframboise had escaped a prison sentence until the RCMP arrested him on a U.S. extradition warrant in 2011. “Five years ago, I was watching the news and there was a news bulletin about an escaped convict,” Traverse said. “I got mixed up because they said Laframboise and we knew him as Clifford Thomas. There was still records in our own Indian registry.” Traverse decided to help Laframboise fight extradition. “I took it to the Assembly of First Nations, all the way to the Chief’s office,” Traverse said. “To seek intervention through the Justice department because he was one of those Sixties Scoop children who grew up in foster homes in the States.” Traverse’s brother Dave Traverse is currently Chief of Kinonjeoshtegon First Nation and they worked together to obtain legal counsel for Laframboise to fight extradition. “It was minor things that put him in jail and I’m not sure how he was brought up,” Chief Traverse said. He grew up playing with Laframboise and his sisters and decided to hire Laframboise when he returned home. Former Justice Minister Rob Nicholson eventually ordered Laframboise’s release, but he was stuck in limbo at Headingley Correctional Institution in Manitoba for two years. Laframboise and his wife Ora live in Jackhead with their six children. Despite finally finding a true home, Laframboise still feels the weight of his history. Bill Traverse has met many First Nations men and women who feel the way Laframboise does. Traverse helped form Anishinaabe Child and Family Services in the 1980s, which had a sub office to help children of the Sixties Scoop who were trying to return home. The repatriation office eventually shut down due to funding issues. Traverse himself is a residential school survivor and believes people like Laframboise had part of their lives stolen by the Sixties Scoop. Though Laframboise has reunited with his family in Manitoba, his two living sisters remain in the United States.